4 Building The Next Phase in Ontario’s Education Strategy. 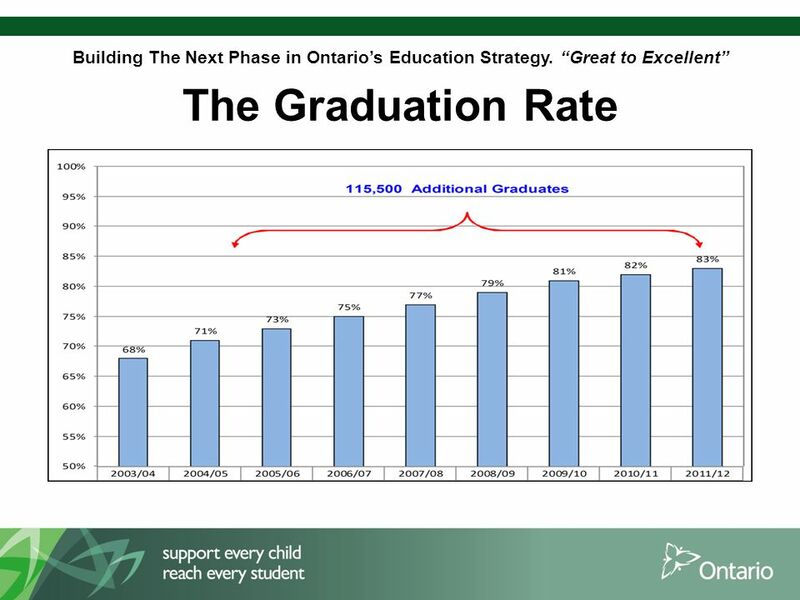 “Great to Excellent” Where We Have Been Education in Ontario come a long way in the last ten years. Today, Ontario’s publicly funded education system is recognized as among the best in the world. A decade ago, only 68% of our students were graduating, and only 54% of children in grades 3 and 6 were achieving the provincial standard in literacy and numeracy. Thanks to our Student Achievement Strategy, today those numbers stand at 83% and 71% respectively, and they continue to climb. We have closed achievement gaps significantly for several groups, and are making progress on closing gaps for others. 7 Building The Next Phase in Ontario’s Education Strategy. “Great to Excellent” How does Canada compare? McKinsey Report 2009: How the World’s Most Improved School Systems Keep Getting Better –Ontario: from 2003-2009 moved from “good” to “great”, now moving from “great” to “excellent” In Ontario, the difference in achievement between students in the top socio-economic quarter and the lowest quarter was 50% below the average of the rest of the country. In the 2010 Pan Canadian Assessment Program, Ontario was the only province that placed above the Canadian average in reading, math and science. 9 Building The Next Phase in Ontario’s Education Strategy. “Great to Excellent” From Great to Excellent It is now time to build an updated vision for the next phase of education in Ontario. Your input, through this public consultation process, will help craft the next phase in Ontario’s education strategy. The updated vision for our education system will be launched in early 2014. 10 Building The Next Phase in Ontario’s Education Strategy. “Great to Excellent” Why Consult Now? After our successes over the past decade we want to set our sights even higher. We must prepare students for our technology-driven, rapidly changing, globalized world. This requires a greater emphasis on higher-order skills, such as critical thinking, communication, collaboration, creativity and entrepreneurship. Almost six years have passed since the strategic plan for Ontario education was re-visited with “Energizing Ontario Education”. We must keep moving forward and raising the bar! 12 Building The Next Phase in Ontario’s Education Strategy. “Great to Excellent” Where Are We Today? 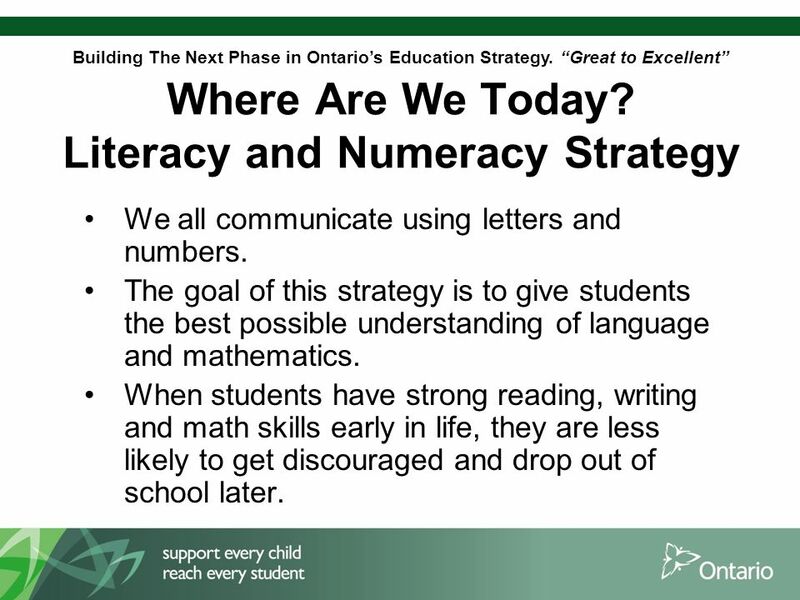 Literacy and Numeracy Strategy We all communicate using letters and numbers. The goal of this strategy is to give students the best possible understanding of language and mathematics. When students have strong reading, writing and math skills early in life, they are less likely to get discouraged and drop out of school later. 13 Building The Next Phase in Ontario’s Education Strategy. “Great to Excellent” Key Approach: Student Success Strategy The goal of this strategy is to keep students in school, learning until the age of 18 or graduation. We want all Ontario students to graduate and realize their full potential. Education is directly linked to quality of life. The longer a child stays in school, the better chance that child has of finding a good career and living a happy and healthy life. 14 Building The Next Phase in Ontario’s Education Strategy. “Great to Excellent” Where Are We Today? Our goal is to develop a plan to modernize teaching and learning in Ontario and bring greater focus to higher-order skills such as innovation, creativity and collaboration. This plan includes: Better use of technology to support learning. Developing skill-sets that better reflect the needs of Ontario students, now and in the future. Better preparing them for the jobs of today and tomorrow. 15 Building The Next Phase in Ontario’s Education Strategy. “Great to Excellent” Where Are We Today? Healthy Schools and Student Well-Being By giving students a safe and healthy place to go to school, and by fostering a sense of belonging, we give them the best chance to learn and grow. We want Ontario schools to be safe, healthy places where all children feel welcome. The aim of the Healthy Schools Strategy is to: Keep our schools safe and give students a place where they are able to reach their full potential. Focus on meeting the needs of the whole child. Create partnerships with families and community agencies. 16 Building The Next Phase in Ontario’s Education Strategy. “Great to Excellent” There is More to Do Looking ahead, we must consider how to best address the needs of students who struggle in our current system. 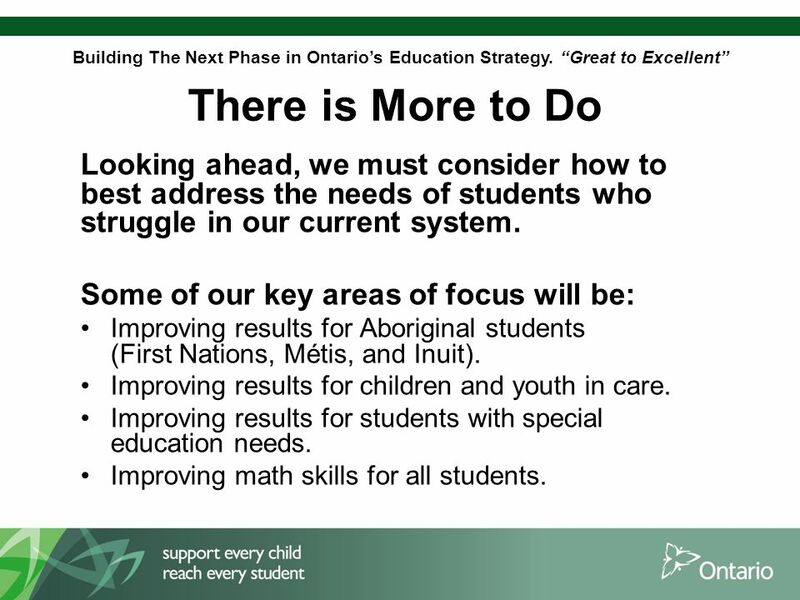 Some of our key areas of focus will be: Improving results for Aboriginal students (First Nations, Métis, and Inuit). Improving results for children and youth in care. Improving results for students with special education needs. Improving math skills for all students. 17 Building The Next Phase in Ontario’s Education Strategy. “Great to Excellent” The Consultation Process A four page document was created, based on conversations with our education partners. –This document included seven questions which we will focus on today The document has been sent to traditional and non-traditional stakeholders for consideration over the summer. The ministry is conducting provincial, regional, internal and digital consultations throughout the fall. 18 Building The Next Phase in Ontario’s Education Strategy. “Great to Excellent” The Seven Questions 1.What are the skills, knowledge and characteristics students need to succeed after they have completed school, and how do we better support all learners in their development? 2.What does student well-being mean to you, and what is the role of the school in supporting it? 3.From your perspective, what further opportunities exist to close gaps and increase equity to support all students in reaching their full potential? 4.How does the education system need to evolve as a result of changes to child care and the implementation of full-day kindergarten? 5.What more can we all do to keep students engaged, foster their curiosity and creativity, and help them develop a love of life-long learning? 6.How can we use technology more effectively in teaching and learning? 7.In summary, what are the various opportunities for partnership that can enhance the student experience, and how can they benefit parents, educators and our partners too? 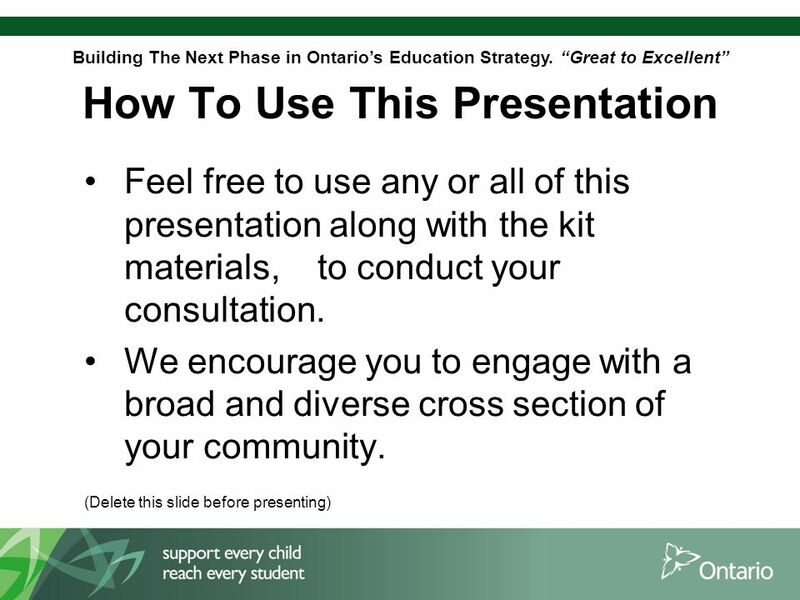 Download ppt "Building The Next Phase in Ontario’s Education Strategy. “Great to Excellent” Building The Next Phase in Ontario’s Education Strategy “Great to Excellent”"
Effective Governance Relationships Wetaskiwin Regional Public Schools Story. Presentation to the HKPR District Health Unit Board of Health September 18, 2014 Presented by Karen Pettinella Haliburton, Kawartha, Pine Ridge District. 1 “We are improving each year. People are getting smarter. We are starting to think school has potential!” - Ontario elementary student 2010 Dr. Mary Jean. Moving forward with Curriculum for Excellence Phil Denning HMI.